They were straight out of Boss Angeles, under the deafening noise of all the planes coming in and out of LAX. Instrumental surf band The Crossfires became folk rock-pop-psychedelic group The Turtles, though you could say they defied any particular classification. Howard Kaplan and Mark Volman were pretty nerdy guys growing up in Westchester, hanging around in high school with buddy Al Nichol, upsetting the balance of the school's Glee Club and taking a quick shot with another student, Betty McCarty, as an aspiring early-'60s folk music foursome christened The Crosswind Singers. When that idea fell apart around 1963, at about the time surf music was at its peak (red-hot in L.A. where most of the surf bands were centered), Al had already mastered his guitar better than most could a third arm they were born with, and Howard and Mark had both figured out how to blow a mean saxophone. They threw in with bassist Chuck Portz and drummer Don Murray, calling themselves The Nightriders, but changed it soon afterward (maybe to avoid confusion with a group of southern terrorists circa 1908 who went by the same name and were still fairly well remembered). The guys took the first part of their short-lived folk group's name, and the Crossfires started making some noise, enough at least to get a single released on a local label. They were on their game the day "Fiberglass Jungle" was recorded. The sax blasts were smokin', Al's facile guitar work showed potential for greatness...this record had "surf" written all over it. Yet the song went mostly unnoticed, even in Southern California. On the positive side, live gigs came their way, lots of them, more parties than club dates, but it kept the guys busy. Jim Tucker joined as rhythm guitarist somewhere along the way, the group decided to try a harder sound and it got them a one-off single in early 1965, "One Potato, Two Potato," an ahead-of-the-curve psych tune with hot Nichol guitar licks and a rough 'n' tumble vocal by Kaplan. When that single unfairly fell from grace, some quick scuffling was in order to figure out what to do next. They decided to soften their sound a bit and get with the prevailing folk-rock rage that was happening among American bands in '65 as an answer to the British Invasion of the year before. Crossfires was out as a name and Turtles was in (inspired, at least partly, by the animalesque name of fellow L.A. band The Byrds), while Howard Kaplan changed his surname to Kaylan (remind me to ask him "Why?" someday). KRLA deejay Reb Foster had been keeping an eye on the band's progress since they were surfin' in '63 and approached them about being their manager. 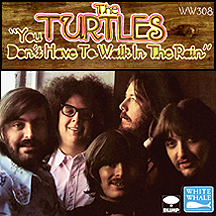 It was a good fit; Reb got them signed to a new label, White Whale, and the company's first single release became The Turtles' first hit. Bob Dylan's "Mr. Tambourine Man" had made the Byrds stars, going all the way to number one in June '65. 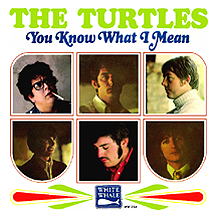 The Turtles employed the same strategy, remaking Dylan's "It Ain't Me Babe," and it worked like a charm - the song went top ten in September. While not exactly a political statement like some of the folk rock hits of '65, the group established themselves in that arena, following with P.F. Sloan's "Let Me Be," a top 40 hit in the fall. Sloan and Steve Barri supplied the band with its third 45, "You Baby," a decidedly "sunny" pop song and a big hit in early 1966. An appearance in the film Out of Sight, pure teen silliness with a non-star acting cast but hot music act lineup (including Dobie Gray, Gary Lewis and the Playboys and others) would seem to have widened exposure for the group but may have had the opposite effect (the movie was that bad). Okay, enough already they figured, time for something way off the beaten path..."Grim Reaper of Love," written by Portz and Nichol, was the next single, a 180 degree turn from "You Baby" and a not entirely surprising stiff, though you'd be hard pressed to find a more deviant downer and simultaneously awesome track among the thousands of single releases of '66. Warren Zevon (known to us at the time as the top half of Lyme and Cybelle, who hit in '66 with White Whale's first non-Turtles hit, "Follow Me") supplied the next dazzler, "Outside Chance," considerably lighter than the subject matter of "Reaper" but with a twist of its own, that of keeping the song's romantic subject at arm's length. It didn't hit but should have. Maybe the group's good fortunes were over, in which case this essay might be finished. Perhaps it would help if the band were to veer away from negativity...but perhaps not; the hopefully romantic Barri-Sloan reprise "Can I Get to Know You Better" struggled as well. Regardless of the tone of each release, B sides and album tracks included, everything the Turtles had come up with to this point was good. Really good. The five (now without Tucker, who'd quit earlier in the year) surely had angels and demons inside, with intentions of exploiting them to push past typical top 40 formulas. But first they just had to take one more stab at a pop love song. First let's get up to speed on the many, sometimes complicated, personnel changes. Don Murray also left the band sometime in 1966 and was replaced by Johny Barbata (who would lengthen his career post-Turtles pounding the skins for Crosby, Stills, Nash and Young, Jefferson Airplane and Jefferson Starship). Chuck Portz departed around the same time, replaced on bass by Chip Douglas, but an opportunity to produce for The Monkees (far and away the biggest thing in music circa '66-'67) was too tempting, which left a spot open for Jim Pons, who settled in for the long haul. A few others slipped in and out of the roster, but those mentioned here are the key players in the annals of the band. With the addition, that is, of one female contributor who would come along toward the end. Garry Bonner and Alan Gordon had put together a demo of their song "Happy Together," and no one in the industry was feeling it - except The Turtles, strangely enough, who felt it was just what they needed for a big splashy return to the charts. The ominous opening riff was an eight second diversion blending into an obviously love-drenched pop song bubbling over with enthusiasm. Imagine the grumbling from all those other artists who rejected the song when the Turtles were sitting at number one with it in March and April of 1967. One of the biggest of all late-'60s hits, it was the group's reprieve, which they took advantage of with an immediate top ten follow-up, "She'd Rather Be With Me," then the nearly-as-big "You Know What I Mean" and '67 slam-dunk year-capper "She's My Girl" (all three also from the pens of Bonner and Gordon). Their version of the John Williams-Leslie Bricusse title theme for the film A Guide For the Married Man, starring Walter Matthau, Inger Stevens and Robert Morse, served as added exposure during the band's hottest year by far. Now that the Turtles were one of rock's biggest groups, they got a little overconfident and decided all, or at least most, of their material would be self-written from that point on. It wasn't such a bad idea artistically, as a steady stream of guilty and not-so-guilty pleasures was in the offing, but hit singles suddenly became scarce. White Whale execs wanted to repeat 1967 ad infinitum, which comes as no surprise; sales had been huge and the music was excellent too. But by '68 the music world was on a psychedelic trip and the Turtles, who'd already toyed in that realm with "Grim Reaper" and a few other songs, wanted the freedom to further explore the mysticism (although more often than not they approached it with a semi-novelty bent). 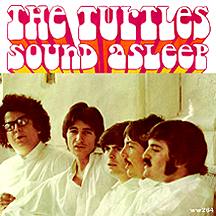 "Sound Asleep," a complete-group creation, was pure fun and catchy too, while Harry Nilsson's "The Story of Rock and Roll" scraped the edges of R&R's beginnings while professing a love for it. But neither was a particularly strong hit. White Whale's bosses had probably put too much faith in the label's star act and began making suggestions that the group basically ignored. Another self-penned group effort, "Elenore," with brilliant off-kilter lyrics like 'you're my pride and joy, et cetera' spared them the wrath of company bigwigs when it returned them to the top ten as 1968's autumn leaves were falling. 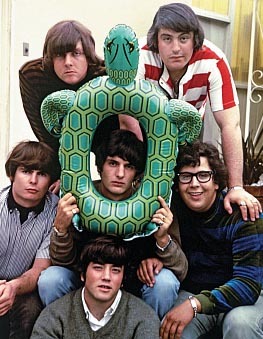 Had 'Elenore, gee I think you're swell' not become a coast-to-coast catchphrase, the group's wildly creative project The Turtles Present The Battle of the Bands might never have been released. A concept album inspired by The Beatles' masterpiece Sgt. Pepper's Lonely Hearts Club Band, their Battle of the Bands album was produced by Chip Douglas (taking a hiatus from his work with the Monkees). Positioning itself as a various artists collection, the Turtles played the roles of 12 different bands, one for each track (with group photos for eleven of the songs). According to the album's inside cover, "Elenore" was purportedly by Howie, Mark, Johny, Jim and Al while its flip side, "Surfer Dan" (a vocal parody of the band's early direction with a spot-on Beach Boys-style guitar solo by Nichols), was shown as an entry by a reunited Crossfires (or Cross Fires in this case). Other mock contributions came from the likes of The Atomic Enchilada, The Fabulous Dawgs and Chief Kamanawanalea and his Royal Macadamia Nuts. Big fun, great stuff. 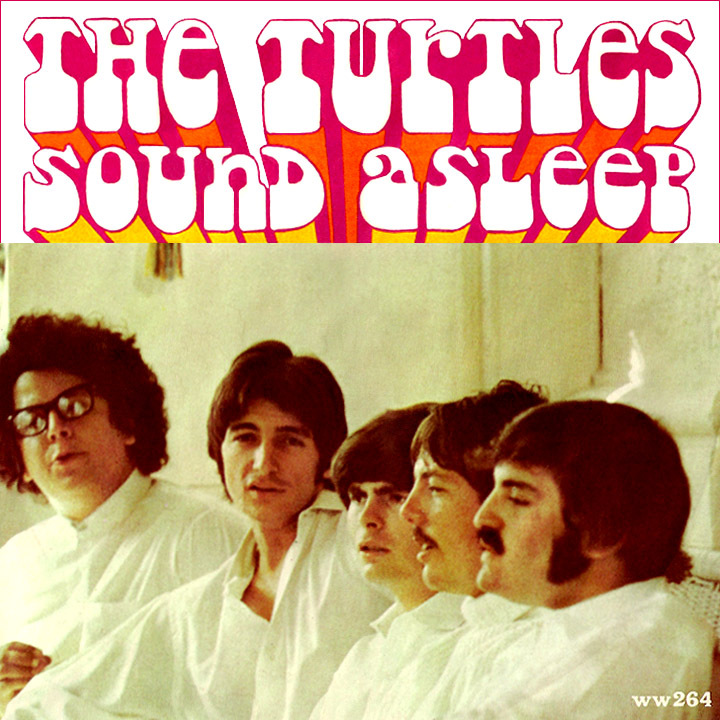 Nine of the album's tracks were written by the Turtles; "You Showed Me" by Roger McGuinn and Gene Clark of the Byrds, billed as an effort by the fake Natures Children, was the next 45 and hit the top ten in February 1969, the unusual choice of a pump organ providing the song's basic structure. It marked a level of staying power for the group: they had scored one or more major hits in each of five consecutive years. After that, hits were harder to come by. Worthy singles like "You Don't Have to Walk in the Rain" and "Love in the City," both produced by The Kinks' Ray Davies, fell short of the top 40 mark. "Lady-O," written by Turtles discovery Judee Sill, who played acoustic guitar on the track, also lacked in airplay and sales (signed to the group's Blimp publishing, Judee went on to record for Asylum Records and amassed a cult following during the '70s). The owners of White Whale Records weren't about to give them any more slack, insisting that Howard and Mark, the band's two constants (ignoring that Al was the third component in that mix), cut the rest of the group loose and commenced doing vocals for studio-produced, company-controlled sessions. They refused, leading to the band's complete parting of the ways in 1970. White Whale continued doing business sans-tortoise, clicking briefly with singles by The Clique and Liz Damon's Orient Express before shutting down operations in 1971. 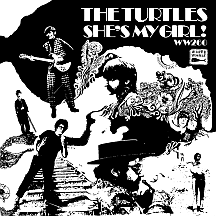 Along the way, without the consent of any band members, the label released a few early Turtles recordings as singles, including "Eve of Destruction" (included on the band's first album at about the same time as the hit version by Barry McGuire) and the Bonner-Gordon song "Me About You" (which had already been attempted by The Mojo Men in '67, Jackie DeShannon in '68 and The Lovin' Spoonful in '69). 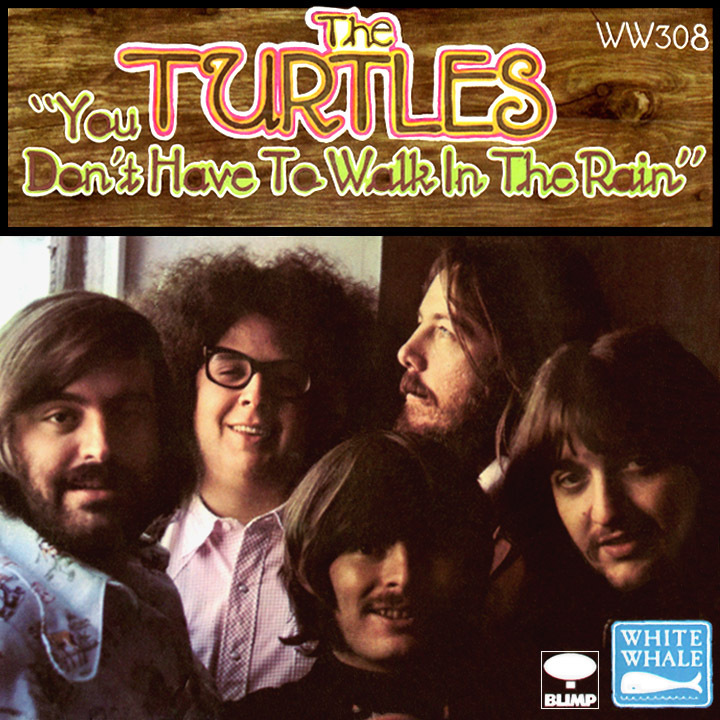 Howard Kaylan and Mark Volman had more desire than the other group members to keep the Turtles going, but White Whale had shrewdly taken contractual control of the band's name and all recorded works, effectively shutting them out. So the two longtime pals went in a new direction (along with Jim Pons) and joined Frank Zappa's Mothers of Invention, reinventing themselves with one of music's all time best Bizarro names, The Phlorescent Leech and Eddie. After a couple of years as Mothers, they put in a lot of studio time doing backing vocals for several acts, including T. Rex (you can hear them on the Marc Bolan-led band's 1972 hit "Bang A Gong (Get it On)") and Bruce Springsteen (likewise his 1980 long-time-coming breakthrough to the top ten, "Hungry Heart"). During the '70s and '80s, under the abbreviated name Flo and Eddie, they had a successful run as radio personalities with shows on Los Angeles stations KMET and KROQ and in syndication. Good things come to those who wait: The dormant White Whale masters of all Turtles material went up for auction in 1974. Kaylan and Volman put in the high bid, becoming sole owners of the band's output. Some legal wrangling secured them the rights to the name as well, and as The Turtles, the bombastic brothers-from-another-mother fronted a changing concert tour lineup (unfortunately without the help of any of the '60s hitmaking band members). These days Howie and Mark spend a lot of time on the road, happy together as The Turtles featuring Flo and Eddie, slaying willing audiences with the group's great songs as only they can.